AC1... Compact 1 litre reservoir model is designed for light commercial vehicles, mini/midi buses and fork lift trucks in 12 or 24 volt with up to 12 lubrication points. 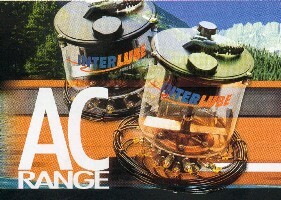 AC 2... Has a 2 litre reservoir designed for use on commercial vehicles, buses and trailers in 12 or 24 volt, serving up to 36 lubrication points. 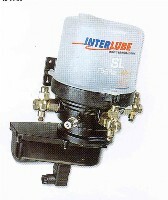 *Adjustable timer memory *Electrically operated *SAE 90 oil to NLGI grade 2 grease. 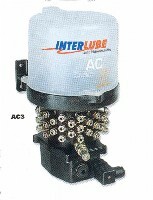 AC 3 Has a 3 litre reservoir and is designed for use on commercial vehicles, buses and trailers, in 12 or 24 volt serving up to 60 lubrication points. The SINGLE LINE Pump is an electrically operated piston pump, supplied with a 12/24v DC controller, which can be fitted with up to three pumping units. Available with 3,6 and 10 litre reservoirs, delivering precise amounts of lubricant through progressive distribution blocks, to all the lubrication points. *Electrically operated,12/24 volts *IP67 Controller *Recommended NLGI Grade 2 Grease *Modular progressive blocks.